Handmade moccasin style men’s comfort shoes and women’s comfort shoes are handcrafted from genuine Deerskin Leather (or cowhide) and available in stock sizes or you may order Custom Comfort Shoes to ensure an exact fit. American made moccasin Comfort Shoes are soft and lightweight and designed for outstanding fit, providing the kind of relaxing freedom and comfort that most people associate to indoor footwear and specifically moccasins. 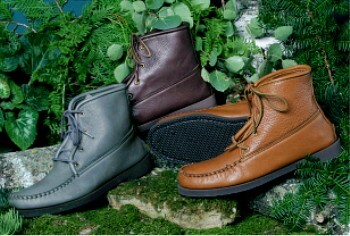 Footskins offers both slip-on style men’s comfort shoes and lace-up style men’s comfort shoes. Slip-On comfort shoes for men come in canoe sole, crepe sole, molded sole, rubber sole and soft sole. Ask us about or collection of Children's Moccasin Comfort Shoes and Baby Moccasins & Booties. More than Just Comfort Shoes! Our skilled craftsmen at Footskins specialize in true moccasin construction and can also create Handmade Casual Shoes and custom made deerskin comfort shoes in a variety of styles including Moccasins, Deerskin Moccasin Slippers, Knee-High Boots , Ankle High Chukka Boots, and Teepee Boots. Footwear by Footskins’ Handmade Moccasins are known internationally and those in the trade recognize us for our American handmade deerskin leather moccasins and handcrafted comfort shoes. Our men’s comfort shoes and ladies comfort shoes are among the finest footwear made today and handmade with the pride of true workmanship and outstanding quality. Order Ladies and Men’s Comfort Shoes Now! For over four decades our handmade comfort shoes and American made deerskin moccasin boots, shoes and slippers have been available to customers throughout North America thanks to the skills handed down from one generation to the next. All handmade moccasins, men’s comfort shoes and women’s comfort shoes are sewn together inside out as opposed to being created using a foot-shaped mold. 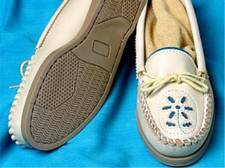 Our moccasin construction workmanship is 100% guaranteed! CST (or order toll free 1-888-720-3131).